"Cde President, you personally stretched out your hand to the opposition after Zanu PF's July 30 landslide victory. 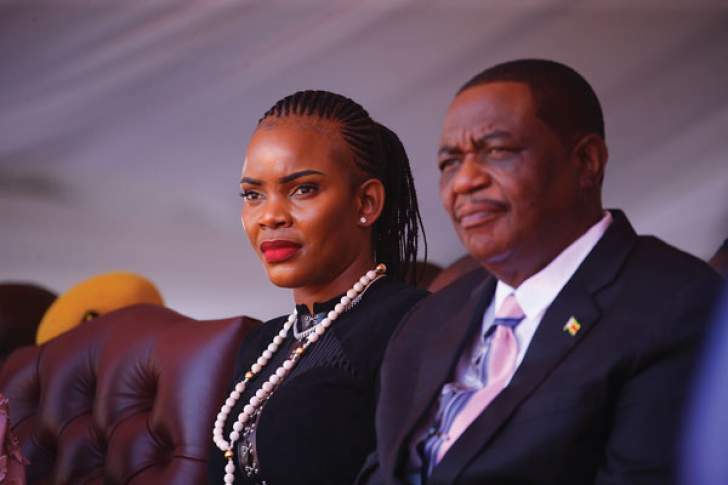 But the opposition spurned that hand," said VP Constantino Chiwenga at the Annual Zanu PF People's National Conference. "You have since withdrawn the well-stretched hand. All of us follow, principally those of us in Parliament are very happy that our Minister of Justice, Legal and Parliamentary Affairs (Ziyambi Ziyambi), acting in his capacity as leader of the House (in Parliament), sent a clear signal of paying back the opposition in the hard coin they have tossed us. They have chosen to disrespect our leader who is the Head of State of our nation (President Mnangagwa). "We have no reason to handle them with the respect they have voluntarily rejected." This is just Zanu PF, the bid bad wolf, flexing big bully muscle! The party blatantly rigged the elections denying over 3 millions Zimbabweans in the diaspora the vote; refused to release the verified voters' roll although this is a legal requirement; refused to free up the public media; in its affidavit submitted to the Con-Court, ZEC had three different vote tally results, proof the figures had been cooked up; etc. All the international election observers have dismissed the elections as flawed and illegal. Even the British who had been bending over backwards to help Mnangagwa regime to be accepted back into the world community ever since last November's coup, could not gloss over the blatant vote rigging. The outgoing UK Ambassador to Zimbabwe, Ms Catriano Laing's, parting shot to the regime was "the electoral playing field was not level"! "The electoral commission (ZEC) lacked full independence and appeared to not always act in an impartial manner. The final results as announced by the Electoral Commission contained numerous errors and lacked adequate traceability, transparency and verifiability," EU Election Observer Mission said in its final report. "Finally, the restrictions on political freedoms, the excessive use of force by security forces and abuses of human rights in the post-election period undermined the corresponding positive aspects during the pre-election campaign. As such, many aspects of the 2018 elections in Zimbabwe failed to meet international standards." If the elections had "failed to meet international standard" there is only one conclusion: Zanu PF rigged the elections, the party does not have the mandate and therefore the regime is illegitimate. MDC Alliance should have never agreed to participate in these elections without first implementing the democratic reforms designed to stop Zanu PF rigging the elections. Nelson Chamisa et al are only joining "Zanu PF is illegitimate" bandwagon for the selfish purpose of wringing gravy train concessions from Zanu PF. Even if Nelson Chamisa had acknowledged Mnangagwa as the winner of the recent elections without the Con-Court challenge; that would not have made all the glaring flaws and illegalities go away. The EU Observers' conclusion that "the elections had failed to meet international standards" was based on the observed glaring flaws and illegalities and not on what Chamisa did or didn't do! Zanu PF's hunger for absolute power and the political influence and wealth it has brought is insatiable. The party has shown again and again that it will do whatever it dimmed necessary to secure power be it rigging elections and even shedding innocent blood. Zanu PF has murdered over 30 000 innocent Zimbabweans to establish and retain the de facto one-party, Zanu PF, dictatorship. The shooting of seven civilians on 1st August 2018 was to quell the protest against another rigged elections and a timely reminder the regime would not hesitate to shed more innocent blood in its drive to hang on to power, regardless of it being illegitimate. Zimbabweans must now brace themselves for the double whammy of the economic hardships from the worsening economic situation, on the one hand. By rigging the elections Zanu PF has just confirmed Zimbabwe is still a pariah state and thus killed all hopes of any meaningful economic recovery. Investors, local and foreign, do not do business in a pariah state. On the other hand the nation will be subjected to increased political repression. The worsening economic situation will force the people to protest their suffering and Zanu PF, fearful of losing its iron grip on power will step up the political repression. Zanu PF blame MDC Alliance's refusal to acknowledge Mnangagwa as the winner to justify its "shoot to kill" against the nation, a case of collective punishment. As far as Zanu PF is concerned it is "paying back the opposition in the hard coin they have tossed us!" This is just the classical case of the bad wolf, up stream, accusing the lamb of mudding the water! Like it or not, Zanu PF thugs now know they will never revive the economy and so they have given up all hope of winning free, fair and credible elections. They are in power and are going to hold on to power by rigging elections, period. If we are serious about reviving the Zimbabwe economy then we must be firm and resolute in our demand for good and accountable government. When we say we demand free, fair and credible elections, we must mean it and there is no better way to show that than punishing those who rig elections. Zanu PF has rig elections for the last 38 years and we have allowed the party to get away with it. There can be no better time to stop the rot than now. Zanu PF rigged the 30 July 2018 elections rewarding the thugs with high office is the most foolish thing we can ever do as the regime is now abusing state power to impose itself and consolidating its dictatorial rule. Zanu PF rigged the elections, the party must be pressured to step down. This is the only way out of the political and economic mess Zimbabwe finds itself in today. Zimbabwe is in this political and economic mess, a man-made hell-on-earth, because the nation has blundered from pillar to post. Time and time again the nation has gone for the ease solution even when it was clear as day it was the wrong solution. We are in a deep hole and there is no down-hill way out. Forcing Zanu PF to step down is the uphill solution and only solution! By allowing Zanu PF to get away with vote rigging these last 38 years has only make it hard for us to these thugs to give up power. Allowing them to stay in power till 2023 will make it even harder to stop Zanu PF rigging the elections and to force them to step down afterwards.